I started working on this company in early 2012. I have always had a strong passion for clothing, art, and design. I loved the thought of producing high quality clothes for people. As I began to work on my line more ideas started to develop. First, the company needed a good name. APS (artists, poets, and soldiers) comes from my interest in the Renaissance era and of the Renaissance Man. If you are not familiar with what this is, I will give you a brief break down. During the Renaissance period, society believed that the human race was capable of anything as long as they kept working, studying, training, and growing. The Renaissance Man was someone that was talented in many different areas like the arts, science, politics, and anything else that would help society to grow. A few things that I have been working on to develop my company as a “Brand” and not just a tee shirt company is with my logos. One of the toughest yet most enjoyable things is coming up with a logo people like and want to wear. This is something I am very proud of. 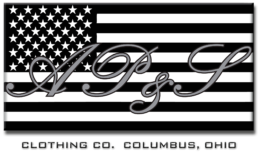 Without major licensing deals (Ohio State, Bengals, Browns, Etc) we as small designers have to sell our own logos and not rely on selling other peoples established logos. So in developing my brand I have tried to incorporate my core set of designs in different ways, Multiple designs incorporating the same logo, wide color range, or even on different types of apparel (hats, socks, etc) Also quality was very important to me. Yes the artwork sells the piece but the quality keeps the customer happy. I chose to use the more expensive American made clothing on my brand because made in the USA and a higher quality product is far more important to me than a profit margin. I myself want APS to be more than just a clothing company. I want my customers to be a part of my company, like a group, club, or even a family. We have teamed up with multiple local athletes to grow both our brand and our teams connectivity in the community. We also try to stay very connected to all of our friends and customers via our social media pages. It’s been an awesome ride so far, I can’t wait to see what the future holds for all of us! Thank you for taking the time to check us out and God bless.